Jean Grey’s spot in the X-Men has long been a tricky one. She was a founding member of the team, and stuck with them until the “All-New, All-Different” team took over in Giant-Size X-Men #1. Jean only actually departed for four issues, before returning for a rematch with the Sentinels that ended in her gaining the powers of the Phoenix Force. She then remained a major player until “The Dark Phoenix Saga” ended with Jean sacrificing herself to save the day…from herself. Then, like some sort of mythological bird that I can’t remember the name of, she rose from the ashes a few years later. From that point forward, she was still a prominent member of the team, but never quite seemed in phase with the rest of them. This kind of reared its head in tie-in materials as well. For the ’90s X-Men toyline, it took three years to get a single Jean Grey figure. 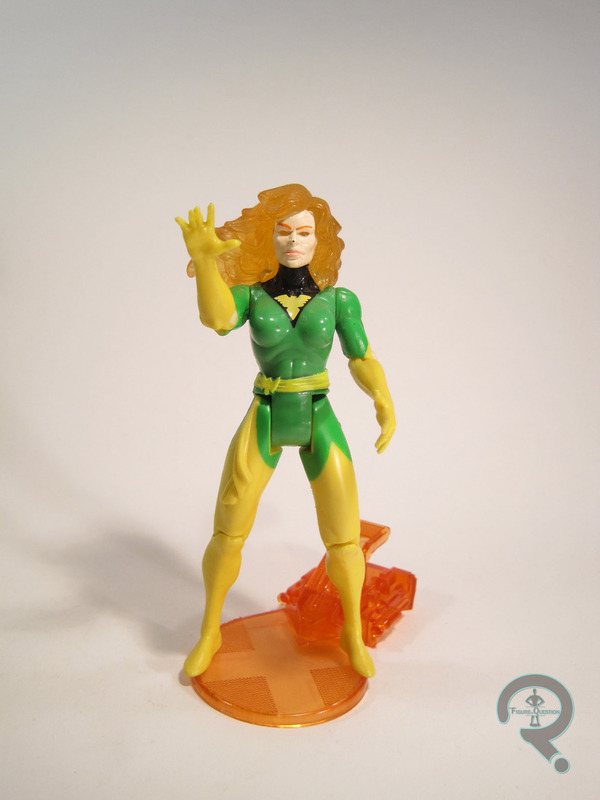 Phoenix was the central figure of the “Phoenix Saga” assortment, the eighth series of Toy Biz’s X-Men line. The assortment was designed to tie-in with the cartoon’s re-telling of the “Phoenix Saga,” and as such featured a number of pivotal players from it (and also Warstar, but we’ll talk about him later), and would not only be the first assortment to abandon a strict numbering system for assortments, but also has the notoriety of being both the last assortment to be released on the slimmer character specific card backs and the first to be released on the newer generic cards, via two separate releases. This was not only Jean’s first figure in the line, but also her very first action figure in general, which was a pretty big deal. The figure stands 5 inches tall and has 8 points of articulation. Like a good number of this line’s early figures, she lacks any sort of neck articulation, due to a light-up feature in the hair. Of course, given the shaping of said hair, it’s unlikely that she would have had much movement going on anyway. Jean’s sculpt was new to her, but would see an inevitable re-use for a Dark Phoenix figure (pictured with Wilson 4) in 1996 as part of the KB Toys-exclusive Marvel Universe line. It’s really not a bad sculpt, especially for the time. The proportions are decently balanced, and not terribly unrealistic, and kind of breaking from a lot of female figures for the time, she’s not hideous or horribly distorted, which was a pretty big deal. Compared to the Rogue figure from the assortment prior, she’s definitely superior, and she blows the Series 1 Storm figure completely away. There have been better Phoenix sculpts since, but it took them a good long while. The paintwork is fairly basic stuff; the colors are bright and fairly eye-catching. The green could maybe stand to be a little darker to better contrast with the yellow, but it’s not terrible. The clear plastic for the hair actually works pretty well, especially when you have the right lighting. The Dark Phoenix figure is pretty much the same paint, but palette-swapped. The yellow parts are now gold, which was an interesting choice, but perhaps not the wisest, as it again leaves the two parts of the costume without much contrast. Phoenix was packed with a launcher stand, re-used from the X-Force line’s Cannonball (yes, Cannonball had a figure before Jean Grey; try not to dwell on it). It’s not the most thrilling extra, nor is it super specific, which is probably why the Dark Phoenix figure dropped it. Jean Grey has been my Dad’s favorite member of the X-Men pretty much since he started reading X-Men. After discovering the Iron Man line on that fateful trip to Service Merchandise, he discovered the X-Men line via this figure (well, his copy of this figure, anyway), which he found at a dealer’s table at a con for the total insane crazy no one would ever pay this much for an action figure price of $20. But hey, it was Jean Grey’s first figure, and he wasn’t going to pass it up, so he did not. …And then KB Toys did their buyout of Toy Biz figures, and you could get pretty much everyone in the line for under $5. Not one to dwell on such things, my dad get me a Phoenix of my own, which I got alongside a Blackbird for the rest of my figures, if I recall correctly. She was amongst 23 X-Men figures of mine that went missing for a few years during my high school/college days, but was discovered during “The Find” and has been on active display since then, because she’s just genuinely my favorite Jean Grey in my collection.